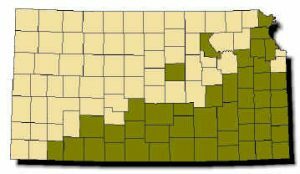 Range: Found from Doniphan County in northeastern Kansas southwestward to the southern High Plains in Seward County. Description: Harmless. Strongly keeled scales; uniform cream or yellowish belly with indistinct dark shading on edges of scales; underside of tail uniform cream or yellowish; head, body and tail either a uniform dark gray, olive or brown (old adults) or with 30–40 blotches of similar color separated by very indistinct light bands (young adults). Young strikingly marked with dark brown bands and/or blotches separated by light bands. 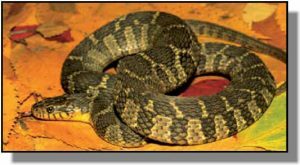 Habits: Inhabits swamps, marshes, ponds and slow-moving portions of streams; least aquatic of Kansas water snakes; wanders great distances from water during summer. Active from March to October. During day, basks near water on driftwood, low-hanging branches, stumps or brush. At night, forages for food. Litters vary from 4-30 young born in late July, August and September. Adults feed on frogs; young prefer small fishes.